These courses aim to introduce participants to repairs of industrial electronic circuits and components. Participants will learn the repairs methods through hands-on testing and experiments. They will be exposed to the theories of industrial electronics repairs and Fictron’s 10 years experience in repairing techniques. Our courses are designed to cater from the novice all the way to the most experienced. Those who pass this course will get an insight of electronic design through the experiments as well. Our satisfactory rate has been over 95% percent so far. Join us Today! Industrial Electronic Repair Level 1 will teach a beginner how to use basic equipment to be able to troubleshoot industrial control electronic boards. 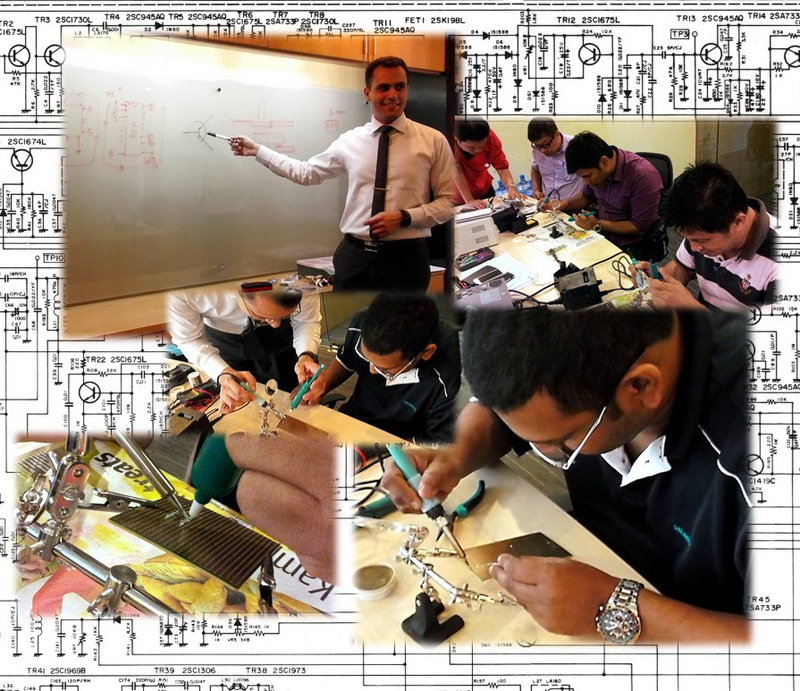 They will learn about safety of the devices and themselves and will be exposed to a very practical approach towards electronic repair right from the start so they can test each and every component and troubleshoot simple boards upon the completion of the course. The participants will gain a good practical knowledge of soldering, desoldering & maintaining through-hole PCB boards with minimum risks. Click Here to learn more about Industrial Electronic Repair Level 1. Industrial Electronic Repair Level 2 will teach an electronic technician about advanced methods of repair & equipment in general. Troubleshooting in depth will be discussed along each topic (Analog and Digital Circuitry). Through experiments, they will be experiencing the behavior of each and every component in detail to be able to troubleshoot 'without a schematic diagram' and by only 'observing the damaged circuit's behavior'. The participants will gain a good practical knowledge of SMT soldering, SMT desoldering & maintaining SMT PCB boards with minimum risks. Upon completion of the Level 2 course, they will be able to do repair on PCB tracks as well. Click Here to learn more about Industrial Electronic Repair Level 2. NOW, EVERYONE CAN REPAIR LIKE A PROFESSIONAL! Introduction to Electronics: Voltage, Current, Ground, Resistance, Open/Short Circuit. Voltmeter, Ammeter & Ohmmeter mode. Resistors, Color Code, Power Dissipation. Different Type of Diodes and Test Methods. Capacitors: Testing, Coding, Safety & Discharging Methods. Coils, Transformers, Transistors, Integrated Circuit. Basic, Rules, Safety & Techniques of Soldering & Desoldering. Cleaning & Maintaining PCB Boards. Introduction to Field-Effect Transistors (FET), Thyristors, Varistors, Loadcell, Current Transformers. Operation, Testing, Troubleshooting & Repair. Rectifier: Half-wave, Full Wave, Regulators. Analog & Digital ICs Circuitry. Radio Frequency Modulation Method; Transmitter & Receiver. Programming, Testing, & Repair of Components. Introduction, Troubleshooting and Repair of Thermostat & Weight Meters. Techniques and Safety of SMT Soldering and Desoldering. Printed Circuit Board (PCB) Repair Techniques. · Engineers and technicians whom wish to broaden their knowledge in the field of electronic repairs and design. · Sales, Procurement, Management and non-technical staffs in electronics engineering or electronics supply and trading. · Anyone wishing to learn the fundamentals of electronic testing, design and repairs. Please note that the entering the Level 1 doesn't require any background in Electronics. For Level 2 however, the participant is required to have either a basic knowledge and experience in the electronics field or pass the Level 1 course first so they can fully benefit from the course. Theoretical sessions shall be followed by practical sessions with occasional quizzes. At the end of the course, participants will complete a project test kit in guidance of our trainers. We Guarantee your Satisfaction! REGISTER FOR A TRAINING SESSION WITH US TODAY AND SAVE YOUR TIME AND MONEY! Like our facebook page and get 2% discount!